**Note: times listed are when vendors should be set-up and ready to go. Fruit Fest: Saturday, June 1st, 1-9 pm. Waterfront (INVITE ONLY—see below): Saturday, June 8th, 11:30 am-8 pm and Sunday, June 9th, 11 am-8 pm. Fete de Marquette (INVITE ONLY—see below): Thursday, July 11th, 4-10 pm; Friday, July 12th, 4-11 pm; Saturday, July 13th, Noon-11 pm; Sunday, July 14th, Noon-10 pm. 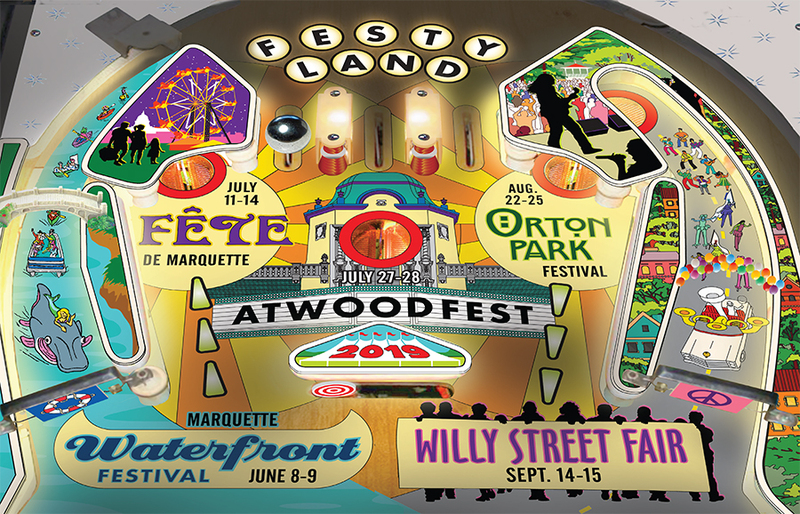 AtwoodFest: Saturday, July 27th, Noon-10 pm and Sunday, July 28th, Noon-7 pm. Orton Park (INVITE ONLY—see below): Friday, August 23rd, 4-10 pm; Saturday, August 24th, 11:30 am-9:30 pm; Sunday, August 25th, 11:30 am-7 pm. Willy Street Fair: Saturday, Sept. 14th, 2-9 pm and Sunday, Sept. 15th, 11 am - 7 pm. Invite only events: to be added to the consideration list, please fill out the form at the bottom of this page. NOTE: Vendors MUST submit payment after adding the application form to their cart. Applications WILL NOT BE ACCEPTED without payment. Arts & Crafts: Locally based small businesses, offering hand-crafted materials, jewelry, clothing, etc. Other-Local: Locally based small business, providing “demos”, subscriptions services, massage, etc. Non-Profit: Locally based non-profits. Non-profits can display membership materials, collect donations, and offer activities (face paint must be approved prior to the event). Non-profits cannot offer any raffles or prize drawings/contests of any kind. Food: Locally based—all food and beverages. Selling beverages only? Contact Beatrice; special accommodations may be possible. All non-food vendors selling anything MUST have a WI Seller’s Permit #. Visit the WI Department of Revenue here or call 608-266-2776. The permit is $20 for the first two years, and $10 to renew. Not sure category you fit into? Email our vending coordinator, Beatrice, here. Non-locally based businesses and organizations, and businesses and organization affiliated with large or national corporations may request consideration to participate as a sponsor of the event. Non-locally based businesses and organization do not qualify for the locally-based participation fee rate. Introduce yourself and request more information by emailing Beatrice here. ALL FOOD VENDOR Registration Forms now require a $150 security deposit. This deposit is built into the registration form fee. Should no damage occur, you will be refunded $150 within two weeks of the event. ALL FOOD VENDORS must submit a paper copy of their insurance that list the Wil-Mar Neighborhood Center as additionally insured before their registration form will be accepted. Send to: Wil-Mar Neighborhood Center, 953 Jenifer Street, Madison, WI, Attn: Beatrice. NOTE: Vendors MUST submit payment after adding the application form to their cart in order for your application to be accepted by the system. Applications WILL NOT BE ACCEPTED and are not logged into the system without payment. Applications WILL NOT BE ACCEPTED without payment. You MUST submit payment after filling out your application forms in order for your applications to become “logged” into the system. Electricity: $60/event. Electricity is available at Fruit Fest, AtwoodFest, and the Willy St. Fair. It is first-come, first-serve. Share your website if you have one.